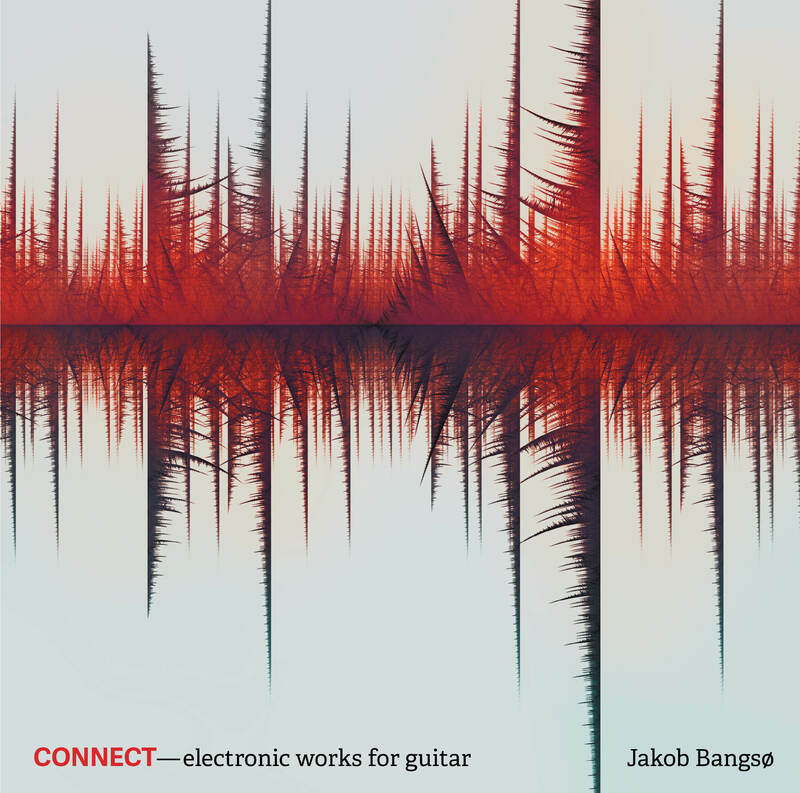 The five composers behind these world premiere recordings, written for the young classical guitarist Jakob Bangsø, all share a keen interest in the field of electroacoustic music. Through live electronics, sound-transforming algorithms and interactive systems, CONNECT explores captivating soundscapes in the borderlands between the acoustic and the digital, the raw and the processed, the heard and the reheard – guitar and electronics are equal partners. The connection between man and machine is more topical than ever before. It is what is in focus in this release, with music as the communicative medium; from the ‘old’ acoustic sound in one corner of the ring to harsh digital noise in the other. In between lies the music, as heard and written by five composers, all with experience of working in this particular field. CONNECT features works, all of which are appearing for the first time on CD. The composers have all worked with electronics and especially with live electronics, presenting here works which also incorporate interactive computer software. The music has its origins in curiosity about the connection between the acoustic and the digital, the musician and the computer, the living and the “replayed”. Within this field between the acoustic and the electronic the works are played out: delicate sounds of the guitar and musical associations with Spain and even Arab scales as against elec­tro­nics that can extend the acoustic tonal universe far into possible futures and remote universes. Guitar and electronics are equal partners. The Danish-Norwegian composer and artist, Tine Surel Lange (b. 1989), works with the surrounding world as both theme and material. She trained at the Royal Danish Academy of Music, Sonic College, the Norwegian College of Music and the Lithuanian Academy of Music and Theatre. Her compositions range from chamber music with live electroacoustics, where classical instruments are treated electro­nically, to soundscapes, ambisonics, industrial sounds, noise, graphics and video. She belongs to a new generation of artists and composers who work with, among other things, ‘3D sound’. Periferi (2016) for guitar and live electronics was commissioned with sup­port from the Danish Arts Foundation and was given its first performance by Jakob Bangsø in October 2016 in Berlin. The work was created with and around direct communication between the guitar and a computer. Constant signal processing, looping and recordings from nature mixed with the guitar’s actual sound are controlled by midi-mapping on a computer keyboard where the guitarist creates the musical building blocks. As a result of this, the work can be built up individually for each performance. The result is a composition where the delicate tones of the guitar become ‘larger than life’ and occupy the space both in the purely physical sense around the listener, but very much also the inner space where the listener is moved by the intimacy and range of the guitar. Andreja Andric (b. 1973) is a Serbian composer, sound artist and programmer living in Aarhus. His main interest is in the playful exploration of mathematical and aleatory processes. He works with pure conceptions of space, time, colour and vib­ra­tion, and he uses computer programming as a central part of his artistic com­muni­cation. Andric is active in audio art, video, software art and virtual reality. He has a Ph.D. in Computer Music Applications from the University of Milan, Italy. His com­­puter music work Spill won First Prize at the SONOM Sound Art Festival in 2017, while his work Spread won Second Prize at the same festival in 2014. In Streams (2015) the sound of the guitar is resampled in real time with the aid of computer software written specifically for this work by the composer. In each movement the process to which the sound of the guitar is subjected is different, so although the sound source is in principle the same – a guitar – each movement is different, not only in the sound, but in the whole musical expression. The noises, scraping, sliding notes and unsteady moods produced by the processes created with the software give the music a quite special character of soft timbre and rough sur­face at one and the same time. Streams has been created as a series of contrasting movements where Dance #1 and Dance #2 provide fine, light contrast with the dark, exploratory expression of the other three movements. Klavs Kehlet Hansen (b. 1990) trained as a classical guitarist at the Royal Academy of Music in Aarhus with further studies in composition with Simon Steen-Andersen and Niels Rønsholdt in 2014. He has been a prizewinner in the Concorso di Composizione per Chitarra G. Petrassi 2014 in Italy and has a wide-ranging career as a composer, performer, installation artist, teacher and video producer in a large number of musical and experimental contexts. Feed (2016) begins with the open chord of the guitar, and immediately afterwards a reaction to the chord: a howling sound that grows out of it. And so it continues. As if feedback, howling, chords and rhythmic pulses are all reactions to the first, quiet chord. The primal sound of the guitar is the basis for all the other, wilder and more mournful sounds that arise. Feed was composed for prepared guitar and transducer in 2016 and was given its first performance the same year by Jakob Bangsø at the PULSAR Festival in Copenhagen. The work explores the sound world of the pheno­menon feedback between a piezo-microphone, a slide-guitar bottleneck with a transducer attached and the natural harmonics of the guitar. Wayne Siegel (b. 1953) has written music in many genres, all the way from electronic music to orchestral works, from chamber music to a science fiction opera. Leading international artists, including the Kronos Quartet, Singcircle, Safri Duo and Harry Sparnaay have commissioned works from him. His music has been performed in Europe, America and Asia. Siegel’s works often fall between genre names, because they combine different elements and composition techniques with among other things influences from folk music, rock and minimalism. Since 1986 Wayne Siegel has been a teacher and inspirer for several generations of composers who work with electronic music: first as the director of DIEM (Danish Institute for Electronic Music) and from 2003 as a professor at the Royal Academy of Music in Aarhus. In 2013 Siegel was awarded the lifetime grant of the Danish Arts Foundation. In Dive (2016) a signal-processing technique called ‘convolution’ is used to cross the sound of the guitar with recordings of splashing water, waves on the beach and bubbles. Each sound the guitarist produces is transformed into a kind of ‘water guitar’. Dive was originally written for cello as the second movement of Three Studies for Cello and Computer, but was later commissioned in this version for guitar by Jakob Bangsø and given its first performance at the Aarhus Concert Hall in April 2016. The sound in Dive is, as the title suggests, almost like when one sinks one’s head under water, and the sounds of the outside world are muffled at the same time as the sounds in the water are emphasized. When listening to the work one can also get the impression that it is not the Danish Kattegat one has sunk one’s head into but perhaps the Mediterranean or the Red Sea – bodies of water that carry the sound of an Arab oud, of quartertones, sliding phrasing and ornamented melodies. Kaj Duncan David (b. 1988) works in the borderland between audio art, electronic music, audiovisual performance and notated composition. Light as a completely inte­grated musical voice plays a central role in much of his work – for example in works for solo instruments and ensembles, and in installations and when he himself performs. Kaj Duncan David has also made music for dance and experimental music theatre and his work is regularly performed at inter­national festivals of new music. He has studied sound art, electronic music and stage composition at Goldsmiths, DIEM (Danish Institute for Electronic Music) and the Hochschule für Musik in Dresden with among others Simon Steen-Andersen and Manos Tsangaris. About 451 (2015) the composer writes: “This piece is concerned with, among other things, an intuitive approach to music-making. I have taken (humbly) as my inspiration the energy and ­approach of guitarists and improvisers such as Derek Bailey, Fred Frith and Julia Reidy. The notation aims to give the performer a certain rhythmic freedom in search of an immediate and intuitive playing style, rather than one in which the performer is bound to an exacting time code”. The title can guide the thoughts in various directions: to the title of Ray Bradbury’s famous novel Fahrenheit 451, and to a classic chord progression which is a fixed component of all tonal music: subdominant, dominant, tonic. But neither of these will either wholly or partly explain the crackling, living, agitated first part of the music, or the serene and meditative ending.